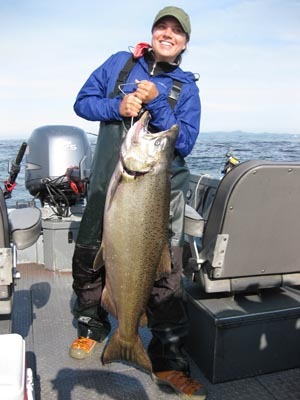 Columbia River fishing guide, Kevin Newell welcomes you to join him for a Columbia River fishing adventure like no other! Incredible salmon fishing and sturgeon fishing trips! 24' x 9' Custom built guide boat, comfortably seats six! Being a Columbia River fishing guide allows me to take you to the largest Chinook salmon and sturgeon producing river in the world. The Columbia and it's tributaries are consistently the highpoint of our Washington and Oregon fishing seasons! All I do is fish! Fishing is all I do! Day in and day out, when the fish are running you will find me on the water. I'm on the water, and on the fish, seven days a week for weeks on end. I'm out there doing what I do and know best, and that is keeping my customers happy by providing a fun, productive, first class fishing trip on the Columbia River! When you go with me your going with someone who is in the loop and knows what the fish are doing and what they are biting on. I'm going to treat you like a friend and we're going to fish with the best equipment available. ODFW says the 2012 Columbia River Spring Chinook run estimate combined with the Willamette River Spring Chinook run will be close to 394,000 Chinook! 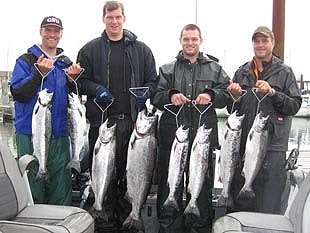 Columbia River fishing guides like Kevin specialize in year around fishing on the Columbia River fishing for spring Chinook, Sturgeon, summer and fall Chinook and Coho Salmon. His focus on mobility and staying on the fish takes him all along the lower 137 miles of the Columbia from the Pacific Ocean to Bonneville Dam in the Columbia River Gorge. 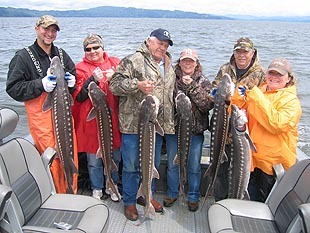 All of the fish we catch on our Columbia River guided trips taste great! When you're thinking about the fish feed, don't forget the Dungeness Crab ... crabbing is also something we can do! Dungeness crab are plentiful in the ocean and on the lower Columbia. Crabbing can be added to your fishing trip or we can just go out crabbing! 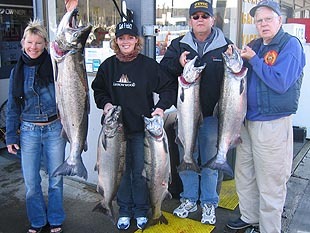 Whether you're after oversize sturgeon, trophy king salmon, keeper sturgeon out of Astoria, or a boat load of acrobatic Silvers, then Kevin has a trip that can be custom tailored to what you're looking for!